I regret to inform you all, but after 4 long years of being a dedicated webmaster, I have decided to stop working on "America's Sweetheart, Betty White" as of September 1st, 2004. What does this mean? Well, it means one thing -- This website will NO LONGER be updated as of Sept. 1st. I have loved being a webmaster to a very successful website, but unfortantely, I'm at a time in my life where I need to focus on my career and life. I do not want to have a website up, when I know that it is not 100% of what it could be. This does NOT mean that I have lost interest in Betty White, or that I am loosing interest in Betty's work. I am still as big, or even bigger fan of Betty's today than I was when I started this site 4 years ago. It's been fun, and I know that SO many of you have appreciated this website, and that means a lot. Your comments through the years have been appreciated. This site is a total trip through Betty's television history. I have been a Betty White fan for many years, and dedicate my self to this site. So, sit back and relax while you take a trip through the life of America's Sweetheart, Betty White. On this site, I plan to have very detailed information about Betty, the shows she starred on, her animal love, her love with game shows, her role as Rose Nylund and Sue Ann Nivens, and let's not forget a page about her four books! America's Sweetheart, Betty White will be updated frequently. Please check back to this site often for new updates, news, pictures, and more! If you have a question, please feel free to email me from the "contact me" page. Thanks! Mark that you were here to learn more about Betty! Sign the guestbook! . :.Disrespectful entries will not be tolerated.:. 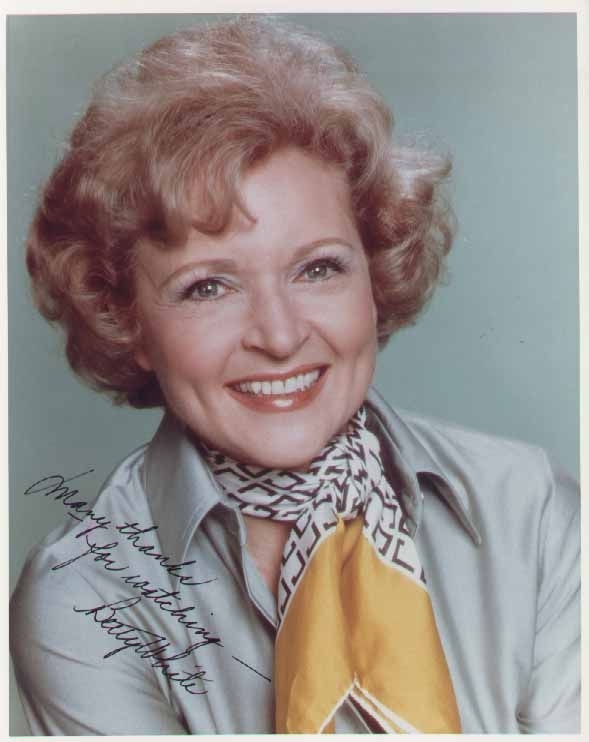 America's Sweetheart, Betty White: copyright ©of Lauren Adler, ©2004. Nothing may copied or reproduced in ANYWAY with out a written letter from the webmaster.
.:.Please Note.:. I am NOT Betty White, and I do not have personal contact with her. I am just a fan, like you, but have dedicated a website to her. Please DO NOT email me requesting autographs or personal information about Betty White. :.